Located inside the State Street Marketplace, Crêpes&Co is a purveyor of authentic french crêpes. Crêpes and Co opened in May 2018 and is located across the Park Hotel, just next to the Hardy Parking Garage. Owner, Vanessa brought back the delicious, savory and sweet crêpes from France. She also brought much more than just Crêpes with her. 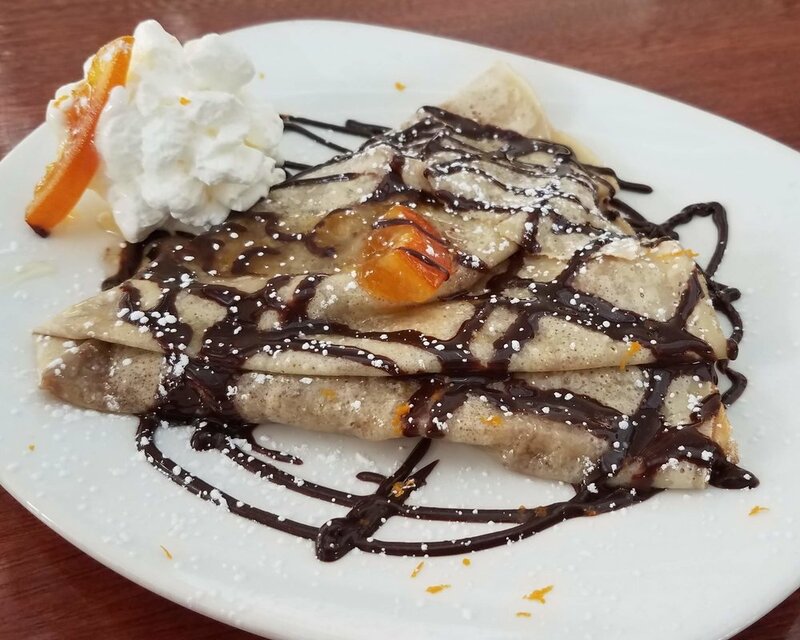 Watch your crêpe being made from scratch as you enjoy the outside patio, or from the counter to see your crêpe transform into a true slice of France here in Traverse City. You will also find the signature Croque Monsieur or Madame one of France's favorite comfort food. Some baked goods that are traditionally French like the Broyé du Poitou, congolais, or more common like great chocolate chip cookies or snickerdoodles are part of the menu as well. The Marketplace offers immediate seating and an awesome pet friendly outside patio. Bay bread Bakery (Sour Dough bread, baguette), Great River Organic Mills (Buckwheat Flour), Sleeping Bear Farms (Honey), Cooper's Family from Brethern, Michigan (Jams), Michigan (Pure maple syrup), Pioneer Michigan (Sugar), Moomers Homemade Ice-cream (Ice-cream). "Consuming raw or undercooked eggs may increase your risk of foodborn illness"
You will find our soft drinks listed below. The marketplace serves anything stronger at the Market Bar. Included with your coffee sugar, heavy cream, Milk, Almond Milk, cocoa powder, cinnamon, cups, lids, stirrer. $0.20 off if you bring your own cup. We can come to you for your special event or you can come directly at the State Street Marketplace where we can cater for you. Contact us to personalize your menu. We offer Crêpes (Savory or Sweet), Croques (only on site), Appetizer platters (exemple given here are serving 25 guests), soups and Higherground Coffee.